Peritonitis is the most feared complication of peritoneal dialysis (PD). However, noninfectious complications contribute significantly to the technique failure. These can be categorized as catheter related and noncatheter related. The noninfectious catheter problems most frequently described include outflow failure due to omental wrap, constipation, bend in the catheter, intraluminal obstruction due to fibrin or blood clot, pericatheter leaks, hernias, malposition and particularly migration of the intra-abdominal portion of the catheter to the upper quadrants, and perforation of intra-abdominal organs. We describe this case here and also review the literature on unusual complications of peritoneal catheters. A 54-year-old woman with history of poly cystic kidney disease, hypertension, hypothyroidism, and chronic kidney disease with an estimated glomerular filtration rate of 5 mL/ min was provided information about modalities and chose PD. However, given the advanced state of her kidney dysfunction and severe anemia, she was initially placed on hemodialysis (HD) with a tunneled HD catheter while arrangements for PD catheter placement were made. The program’s usual surgeon was unavailable, so an alternative surgeon recommended by the usual surgeon was consulted. Placement was done as same day surgery using a laparoscopic approach and was unremarkable. She remained on HD for two weeks until training began. The catheter was flushed at one week as per our protocol and worked fine. Training went well without any inflow or outflow problem. She was discharged home to continuous ambulatory PD (CAPD) (three exchanges per day using 1.5 L) on a Friday. She presented to the emergency department after she failed to drain the PD fluid three days after her discharge home. The patient reported good inflow of PD fluid during the prior evening but no return of effluent with the morning exchange. She did not report any abdominal pain, fever, nausea, vomiting, cloudy fluid, or constipation. On physical examination, she was afebrile with normal blood pressure. Her body mass index (BMI) was normal. Except for palpable kidneys and obvious intra-abdominal fluid, her examination was unremarkable. Her exit site was healthy and presents in the upper left quadrant of her abdominal wall and was well healed. There was no tenderness of the abdomen or the tunnel areas. The PD nurse was able to infuse peritoneal fluid, but there was no drainage of fluid. A large syringe was attached to the catheter to see if a fibrin clot could be dislodged but without success. An abdominal film was then obtained. Her abdominal imaging [Figure 1] and [Figure 2] was reported as the tip coiled in the right midlateral abdomen, with another section which did not appear connected to the first (as no radiopaque tube connected the two pieces) was located in the left mid abdomen. This portion had a connector device attached to it. Figure 1: Erect abdominal image. Arrows showing the disconnected catheters. Figure 2: Image showing catheter in the right upper quadrant (upper arrow) and connector (lower arrow). PD was held. The center’s usual surgeon was now available and was consulted. He explained that the replacement surgeon had followed his instructions of cutting one silicone catheter and attaching it to a second to extend the intra-abdominal portion. Of note, this surgeon had been placing the PD catheters in the program’s patients for the prior year without any difficulty and had been placing PD catheters for decades for other nephrology groups. The surgeon proceeded to laparoscopy. She was found to have two disconnected pieces of catheter within the abdominal space. One piece was entangled within small intestine loops. Both pieces of the old catheter were removed, and a new catheter was inserted using the same prior technique of attaching two catheters to achieve a long intra-abdominal portion. After a brief period to allow healing, CAPD was resumed without difficulty and continued until her successful unrelated living donor transplant seven months later the same year. The peritoneal catheter was removed two months later when transplant function was assured. She had no peritonitis or exit site infections or hospitalizations during her relatively brief time on PD. There are studies suggesting that a high exit site is preferable for ease of patient use, particularly in obese patients (which this patient was not) or in those with a stoma. For this reason, the presternal catheter was designed by Twardowski et al. The difference between this catheter and the more standard approach lies on the number of catheters and the location of the exit site. While the most peritoneal catheters are a single piece of a flexible silicon rubber; the presternal catheters consist of two separate silicon rubber tubes joined by a titanium connector. The presternal catheter is often recommended for the use in obese patients (BMI >35), patients with ostomies, children with diapers, and patients who prefer tub bathing. The goal is to reduce contamination of the exit site. However, the overall design of the catheter has some risk of disconnection of two parts and in fact as children grow the catheters may need to be replaced. Furthermore, slower dialysis fluid flow may be seen with a presternal catheter because of longer length. In our patient, the catheter was not a presternal one, but two catheters were attached in the intra-abdominal region to allow a high abdominal exit site and still allow the tip of the catheter to remain deep in the pelvis. This was a custom design by the surgeon who was very experienced in placing peritoneal catheters, although we were newly using this experienced surgeon and indeed had only placed four PD catheters for us. This surgeon felt a higher exit site was preferable and possibly leading to less risk of exit site infection, a procedure he had used successfully for many years for the patients of other nephrologists in the region. The PD nurses and nephrologist referring the patient for the PD catheter were unfamiliar with the technique being used. Indeed, the outside of the catheter, except for the high exit site, looked the same as any PD catheter with the titanium connecting the catheter to the extension tubing. 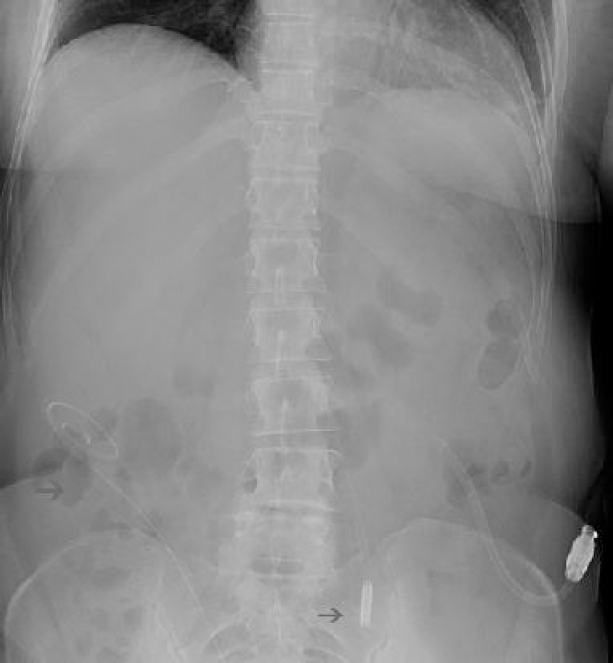 Therefore, the radiograph indicating two intra-abdominal portions of PD catheter was very puzzling until further discussion occurred with the surgeon. Some other unusual complications reported in the literature are listed in [Table 1]. There are two reports of a stone obstructing a PD catheter., In first case, there was a six-month history of slow outflow followed by inflow difficulty in a 62-year-old man who had been on CAPD for 68 months with the same catheter. Radiology showed a stone of 3.9 mm × 3.0 mm sizes that after removal was found to weigh 18 mg. In the second case, a 65-year-old woman presented with inflow obstruction after being on PD for 28 months. The stone size was smaller (2.5 mm × 1.5 mm) than the first case. Both stones were brown and oval with a soft core and consisted of calcium and phosphorous. Abnormal mineral metabolism due to uncontrolled secondary hyperparathyroidism was postulated as the main cause for the stone in the first case but was not the cause of the second, which may have been due to infrequent exchanges. Table 1: Unusual peritoneal catheter complications. The incidence of pneumoperitoneum with PD is common. However, simultaneous pneumoperitoneum and pneumomediastinum are a rare phenomenon. In one case report from Italy; a 75-year-old woman on CAPD for two years presented with abdominal pain and cloudy effluent and was thought to have peritonitis. However, 12 hrs after presentation, her pain disappeared and her effluent cleared. Imaging showed both pneumoperitoneum and pneumomediastinum. This was attributed to a faulty technique of filling without flush introducing considerable air leading to the complication. She improved after reeducation concerning her technique. In another case, a 53-year-old woman on APD for 17 months presented with abdominal pain and hypotension. Imaging revealed pneumomediastinum and subcutaneous emphysema, without any evidence of pneumothorax or bowel perforation. On exploratory laparotomy, the PD catheter was found to be in the retroperitoneum with hematoma formation. Recurrent peritonitis with subsequent adhesions of catheter and inflow under pressure was postulated for the migration and rupture. Damage to the external portion of the PD catheter with subsequent effluent leakage has been rarely reported. The use of mupirocin ointment at the exit site of a polyurethane catheter (as opposed to silicon) has been reported as causing deformities of the catheter with ballooning and subsequent extrusion of the polyurethane catheter in an 83-year-old woman after two years on CAPD. Chemical degradation of polyurethane by the polyethylene glycol base in mupirocin ointment was felt responsible. Tsuchida et al reported two cases of leaking peritoneal catheters due to loss of the structural integrity of the catheter, one with pin holes. Pavey et al also reported pinhole opening near the exit site leading to a dialysate leak possibly related to perforation with a needle during placement. Bladder perforation with the placement of PD catheters is uncommon but well recognized. 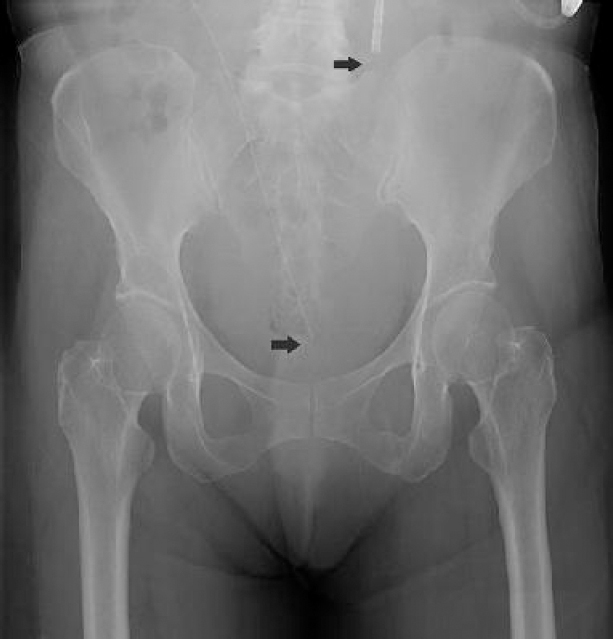 While most of the reported bladder perforations were diagnosed during immediate postoperative period, in the case report by Ounissi et al where the vesicoperitoneal fistulae was detected after 46 months of PD. The patient had recurrent methicillin-resistant Staphylococcus aureus peritonitis for two months before presenting with urinary urgency and urine leak during inflow. Contrast study confirmed the diagnosis, and she was managed by cystoscopic repair. Peritoneal membrane changes due to prolonged infection with failure to remove the catheter in a timely fashion were postulated as the cause of fistulous tract. Catheter tip migrations are very common problems in PD patients, and most often limited to various compartments of the abdomen. This is often attributed to adhesions, constipation, or surgical technique. Unusual site migrations of the PD catheter also been reported. Singh and Misra described an interesting patient presenting with weight gain and outflow problems after 15 months of PD. Computed tomography of the abdomen of the patient showed the catheter tip in the subcutaneous tissue. Infection of a subcutaneously located titanium connector was also reported by Pavey et all in a patient who had three episodes of Acinetobacter baumannii peritonitis. The cultures from the removed titanium connector were found positive for the A. baumannii too, representing a rare type of tunnel infection. There are a number of unusual complications of peritoneal catheter placement reported in the literature. In a recent quality improvement study on catheter placement, PD catheter complications occurred in 41% of patients, with 13% needing PD catheter replacement. Communication among the PD team members including the patient, nephrologists, nurses, and surgeons is essential for successful results. Awareness of unusual complications will facilitate recognition and more quickly lead to resolution. Dr. Guru and Dr. Piraino were involved in the care of the patient care and planning of the manuscript. We affirm that all authors had access to the data and a role in writing the manuscript and that the manuscript is entirely original. Informed consent was taken from the patient for publication. Bender FH. Avoiding harm in peritoneal dialysis patients. Adv Chronic Kidney Dis 2012; 19:171-8. Figueiredo A, Goh BL, Jenkins S, et al. Clinical practice guidelines for peritoneal access. Perit Dial Int 2010; 30:424-9. Tenckhoff H, Schechter H. A bacteriologically safe peritoneal access device. Trans Am Soc Artif Intern Organs 1968; 14:181-7. Twardowski ZJ, Nichols WK, Nolph KD, Khanna R. Swan neck presternal (“bath tub”) catheter for peritoneal dialysis. Adv Perit Dial 1992;8:316-24. Twardowski ZJ. Presternal peritoneal catheter. Adv Ren Replace Ther 2002; 9:125-32. Antoniou S, Syreggelas D, Papadopoulos C, Dimitriadis A. Intraluminal lithiasis of a peritoneal catheter. Perit Dial Int 1991;11:358-60. Skaro DB, Jelicic I, Ljutic D. Intraluminal stone in a PD catheter – a rare complication. Perit Dial Int 2011; 31:371-2. Cancarini GC, Manili L, Cristinelli MR, Bracchi M, Carli O, Maiorca R. Pneumoperitoneum and pneumomediastinum in a CAPD patient with peritonitis. Perit Dial Int 1997;17: 389-91. Zbroch E, Malyszko J, Kamocki Z, Mysliwiec M. Pneumomediastinum and subcutaneous emphysema – unusual complications of automated peritoneal dialysis. Perit Dial Int 2003; 23:97-8. Rao SP, Oreopoulos DG. Unusual complications of a polyurethane PD catheter. Perit Dial Int 1997; 17:410-2. Tsuchida K, Takemoto Y, Nakamura T, Yamagami S. Unexpected complication resulting from peritoneal dialysis catheter break. Perit Dial Int 1998; 18:444-5. Pavey BS, Whaley-Connell A, Nichols WK, Negoi D, Khanna R. A series of unusual complications of the presternal peritoneal dialysis catheter. Adv Perit Dial 2008; 24:113-6. Ekart R, Horvat M, Hojs R, Pecovnik-Balon B. An accident with Tenckhoff catheter placement: urinary bladder perforation. Nephrol Dial Transplant 2006; 21:1738-9. Ounissi M, Sfaxi M, Fayala H, et al. Bladder perforation in a peritoneal dialysis patient. Saudi J Kidney Dis Transpl 2012; 23:552-5. Singh R, Misra M. An unusual complication of a peritoneal dialysis catheter. Adv Perit Dial 2009;25:96-8. Wong LP, Yamamoto KT, Reddy V, et al. Patient education and care for peritoneal dialysis catheter placement: a quality improvement study. Perit Dial Int 2014;34:12-23.